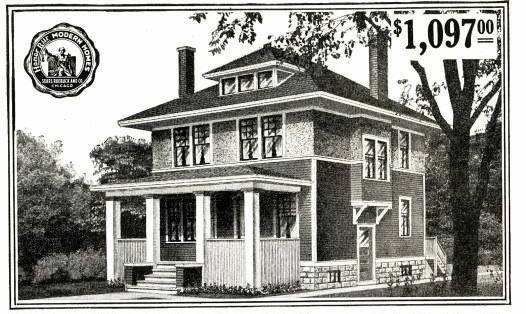 Sears Castleton from the 1916 catalog. Cook County says this Sears Castleton was built in 1915. It could have been... the Castleton was sold from 1911-1924. It must have been a popular model, although I have never seen one other than this house in Des Plaines. There are a lot of American Foursquare houses out there, but the Castleton has an interesting feature. That suspended bay window on the right side is where the staircase landing is. Whenever you see that design feature, you should take a closer look because the house may be a Castleton or a kit home from another manufacturer.